Founded in 2005, Aquatic AV was quick to establish itself as a benchmark in reliable, great sounding waterproof 12V audio equipment. 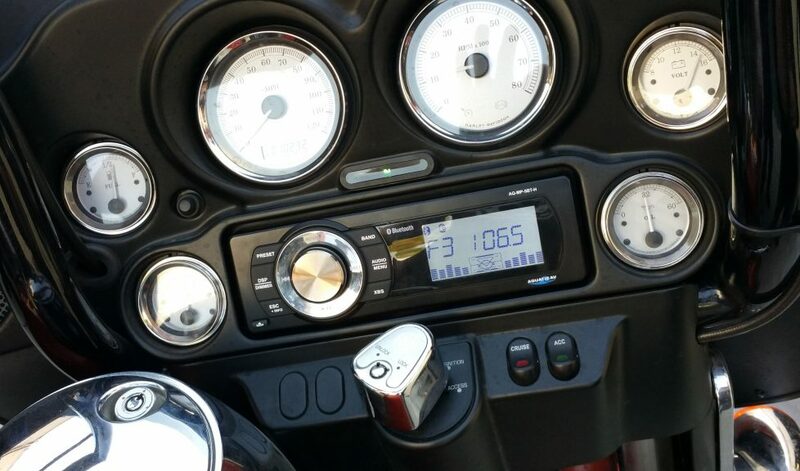 Ten years later in 2015 they released their first Harley-Davidson® Motorcycle stereo, as a replacement to the often underwhelming Harley factory stereos. 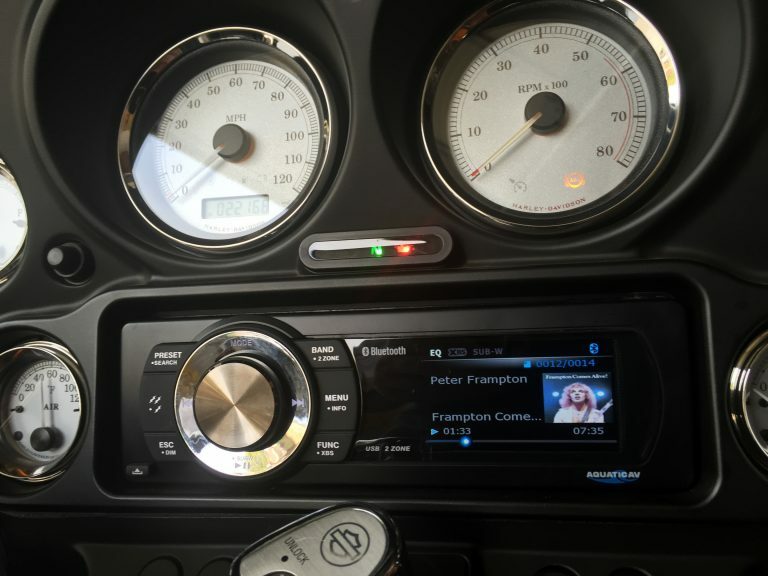 Bluetooth enabled, with a powerful amplifier and compartment to safely store Smartphones and MP3 players, their first Harley stereo (AQ-MP-5BT-H) duly won a number of accolades and was hailed by Baggers across the land as the answer to their long-standing factory stereo complaints. Aquatic AV’s 2017 product line now looks better than ever with the addition of a new SiriusXM Satellite Radio compatible stereo including full color screen, album artwork and clock display modes, plus some seriously cool high-performance speakers. The first thing you’ll notice listening to your new Aquatic AV Harley stereo is the difference in volume – Aquatic AV products are loud by design! After you’ve stopped smiling at the thought of getting out on the road with your favorite tracks you’ll also notice the quality of the sound is greatly improved, with clearer vocals, soaring guitars and beating drums grabbing your attention just like they should do! These things even sound great when you’re travelling at speed! Assuming you’re not using CD or vinyl to play your music these days, at least not on your bike, you’re likely to have joined the digital age and use your phone or MP3 device to store and play your music. Aquatic AV has it all covered with wireless Bluetooth ready stereos as standard, plus USB connections to connect directly to your phone or device. The latest stereo (AQ-MP-5UBT-HS) actually features two USB connections; the first is located within the internal storage compartment, to provide connection, charging and control of your music from the stereo; the second USB connection is located on the rear of the unit and provides charging of your device only. They also include a flush-mounting USB socket so this rear USB connection can be accessed without removing the stereo. You can also connect your Smartphone or MP3 device directly with a standard 3.5mm stereo Jack cable or via stereo RCA (phono) connections. Always with one eye on sound quality Aquatic AV provide high-voltage (4V) pre-outs, maximizing every decibel possible into an additional amplifier, should you so wish. The new AQ-MP-5UBT-HS model features standard AM/FM radio and is also enabled for the popular SiriusXM satellite radio service. You’ll need a SiriusXM vehicle tuner and paid subscription to SiriusXM in order to access the network, but once you’re there you can chose from over 170 stations. It’s important to note Aquatic AV Harley stereos are only compatible with Harley models from 1998-2013. The plug-n-play wiring harness connects directly to the factory wiring harness and uses the existing factory mounting hardware, so installation is a relatively quick and straight forward process, and allows the handlebar controls to continue to be used after upgrading. 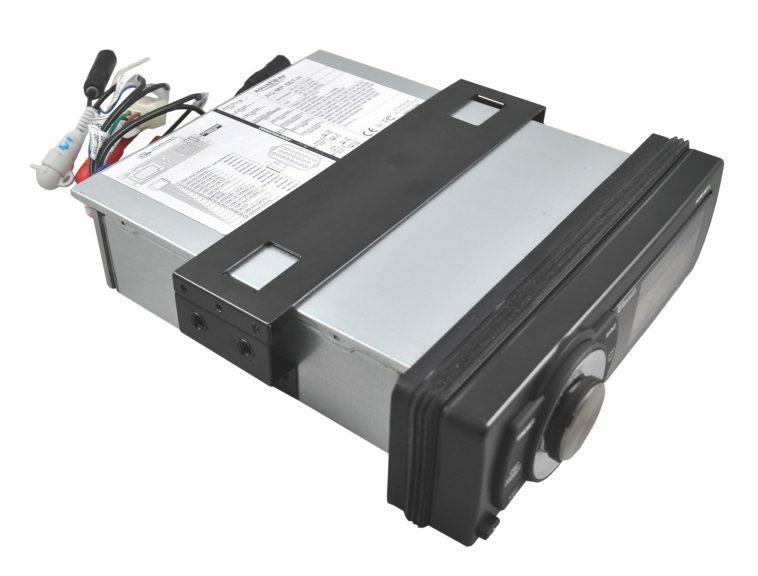 The speakers ship with black mounting rings and grills, to slide right into your existing factory mounting holes. 1998-2013 Harley models will require installation of the grills and mounting rings, while 2014+ models wont. And while we’re on the subject of speakers – do you really need to upgrade these as well? Again, Aquatic AV would say so, and judging by the sound of their AQ-SPK6.5-4HB speakers released earlier this year, are probably right. The AQ-SPK6.5-4HB high-performance waterproof speakers pack some serious punch! Rated at 360W max power output, or 180W RMS, per pair, they deliver what can only be described as an outstanding sonic experience across the frequency spectrum. 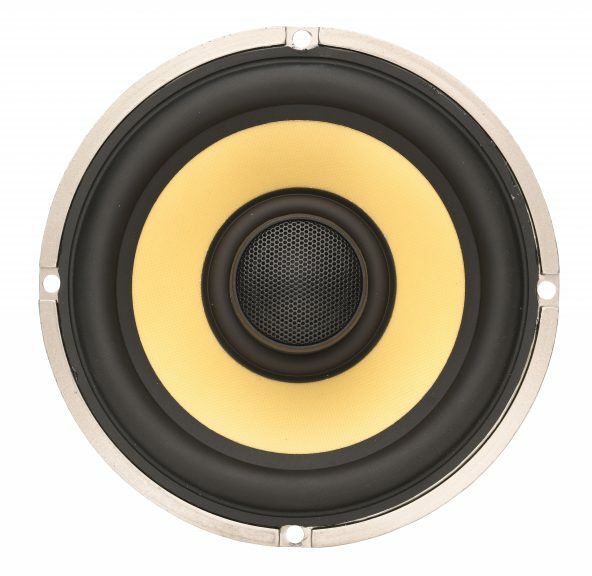 A frequency response of 60Hz-20,000Hz and a 12db/octave crossover create sizzling highs, low-end grunt and everything in between so you’ll notice a big difference compared to the factory speakers, and also most of Aquatic AV’s competitors in aftermarket Harley products. Dollar-for-dollar these speakers come out in front by a clear mile. Much of the detail can be found in the high-frequency content of your music, so to further enhance the listening experience the 1″ silk tweeters can be rotated 360°, directing the sound exactly where it’s needed for your perfect ride! Even small adjustments can make a big difference here so the fact Aquatic AV has developed this feature shows a clear passion for creating a better user experience. The speakers feature a 6.5” complex-fibre cone, 1” silk tweeter and an aluminum basket to achieve their superior acoustic performance, but it also means they look good too! As already noted above, the speakers ship as standard with black mounting rings and grills for a straightforward and speedy installation. 1998-2013 Harley models will require installation of the grills and mounting rings, while 2014+ models wont. What’s over the horizon for Aquatic AV? Expect more products to arrive from Aquatic AV over the next few months to further enhance your Harley stereo experience. Check out the latest developments, product releases and news from Aquatic AV on their Facebook page or on their website www.aquaticav.com/harley. Aquatic AV products are LOUD BY DESIGN. Enjoy the ride! 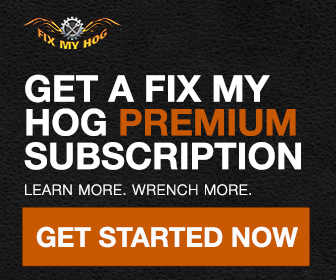 Learn More and Purchase by Clicking Link Below. Interested in this system for my 2001 HD Electra Glide Ultra. Please send pricing information. Need a price for my 2001 harley clascic will it fit & how long is the installation any prints ,you send to Canada ? Need to know how much this system cost and what accessories do I need for my 2012 SG. can Harley Davidson install it. I have 97 road king. Did miss the boat on this, or is there a fix to adapt. Coat for a system for a 2010 Street Glide? Ordered and installed the 5BT-H. Couple of things to keep in mind…For Street Glides it is plug and play but for Ultra’s it will only support plug and play of the front portion of your sound system. The rear speakers need to be added by using the included 4 wire adapter (thanks for the inclusion). You’ll need to know the following… Rear speaker wires are on the 35pin adapter you remove from the original stereo. Wires 1+ and 24- are for right speaker and 2+ and 25- are for left. Connecting to the wires was easy enough once the wires were appropriately matched positive and negative. Also, you will lose all ability to use either headset connector and all rear controls are lost. Not really an issue for single up riding but this creates an issue for two up riding. The system only allows one blue tooth headset connection so if you have a rider you are forced to listen using speakers. I found the use of the internal storage area impossible for my Note4 or my wife’s iPhone 6S (Yes, even without cases) when trying to use both the 3.5mm plug and USB which for this model appears to be required for playing and charging respectively. The only thing I found I could use that would allow plugging in both was an old iPhone 4. Last thing I would share is that if you do any night time riding (which I do often) you will find the readout is extremely bright with what appears to be minimal adjustment. It was bad enough that I had to turn the stereo off in order to see the road and my LED headlights. As a side note, I have read that it also has some visual issues when bright sunlight is a factor. I am adequately satisfied in its performance and it has a ton of features (though no built in clock) and it has a connector for software/firmware updates but it isnt something that you can just plug in to a computer USB to accomplish so I have no idea how complete this process. Love the look and quality but my standard radio in my 2010 ultra has a CB which I use a lot for travel and communication on leading rides. Any plans in adding a cb to your unit? Hi Shannon. You will need to contact the company directly for an accurate answer to your question.